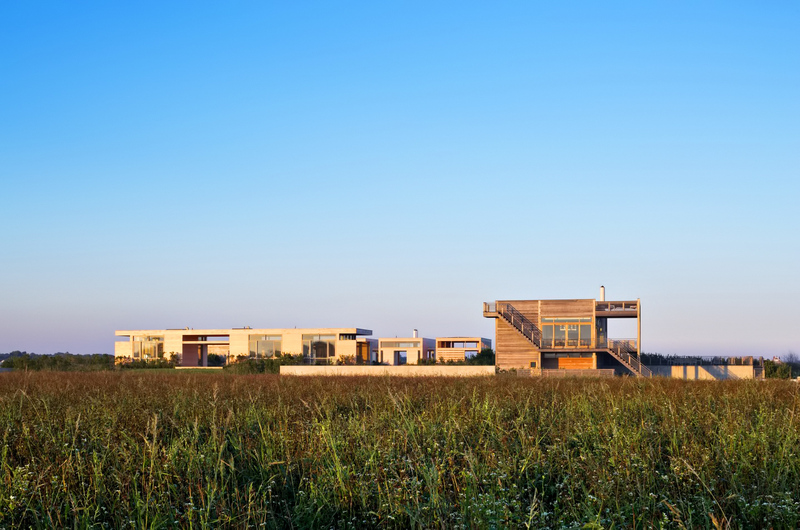 A modernist East Hampton’s Beach House located on a 42-acre oceanfront, pond and agricultural preserve, was designed as a single-family residence that embraces and respects its context. Held by a limited liability corporation called Wainscott Holdings, the property is owned by Jane Lauder, a granddaughter of Estee Lauder, who founded the global cosmetics company that bears her name. The Modernist case study houses of Long Island as documented in Alistair Gordon’s book “Weekend Utopia” were experiments in housing, exploring a kind of modernism set in agrarian and water front locations. In the 1920s, the Hamptons became an architectural think tank where artists, architects, patrons, farmers, fisherman and craftsman converged in one of Americans most unique landscapes where open-air, water, greenery and light converge. The architectural pendulum has swung back and forth and back again: from the experimental case study house, to form follows function, to slavish restoration, post modernism, the McMansion, deconstructionism, and back to a retro modernism. The upside down house was invented there so that public rooms could look across the dunes to the sea while bedrooms were relegated to the lower level. The buildings vocabulary is enriched by the local vernacular of wood on wood. The front facade is positioned like a proud bulkhead preventing the sea wall from flooding the potato and cornfields while a continuous open-air boardwalk pierces through the building past the pool directly to the ocean. The wood frame beam and column structure is articulated inside and out and the outdoor overhangs, balconies, brise soleils, stairs and decks become as important as the enclosed spaces themselves. The water- color palette of sand and sea seamlessly integrate the architecture landscape and interior. The Pond/Ocean Residence is neither the retro modern, upside down house nor a McMansion. In fact its footprint is less than 3,500 square feet on a 42-acre site. It is organized in section like a Fibonacci spiral utilizing five continuous levels of activity culminating in a roof top point look out across the sea, farmlands and pond. North, South, East and West views become framed in the landscape as Ocean, Pond and fully embrace the structure.